SOLD OUT. On July 22, 2017, the Municipality of Tweed will host a Farm to Table Community Dinner to commemorate and celebrate Canada’s 150th anniversary. Everyone is invited to come out and join in the celebration and to be a part of this once-in-a-generation chance to celebrate our community, our agriculture, and our heritage. 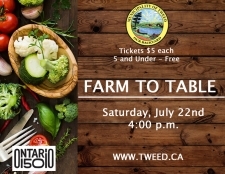 The Farm to Table Community Dinner is a culinary event celebrating and promoting agri-tourism and “foodie” tourism in the Municipality of Tweed and Eastern Ontario.